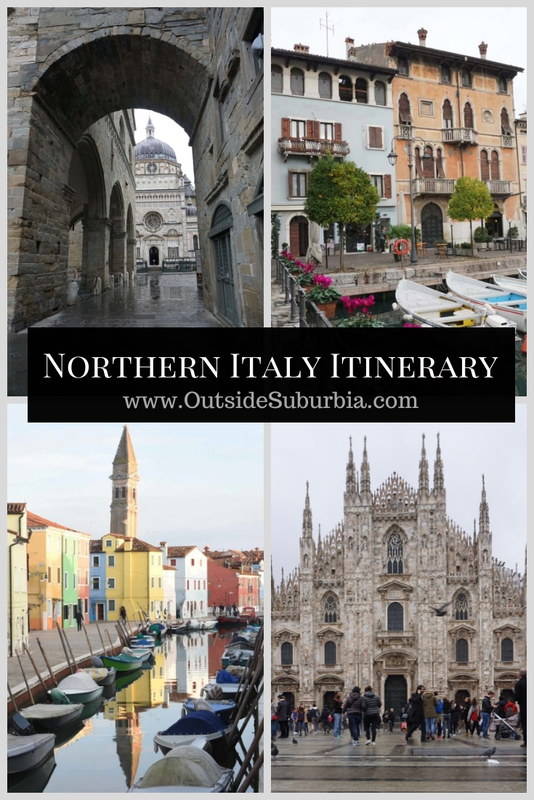 We have been to Italy a few times before, but when Mr.Suburbia mentioned that he saw tickets to Milan at a great price and we jumped on it and booked a Thanksgiving trip to Northern Italy. 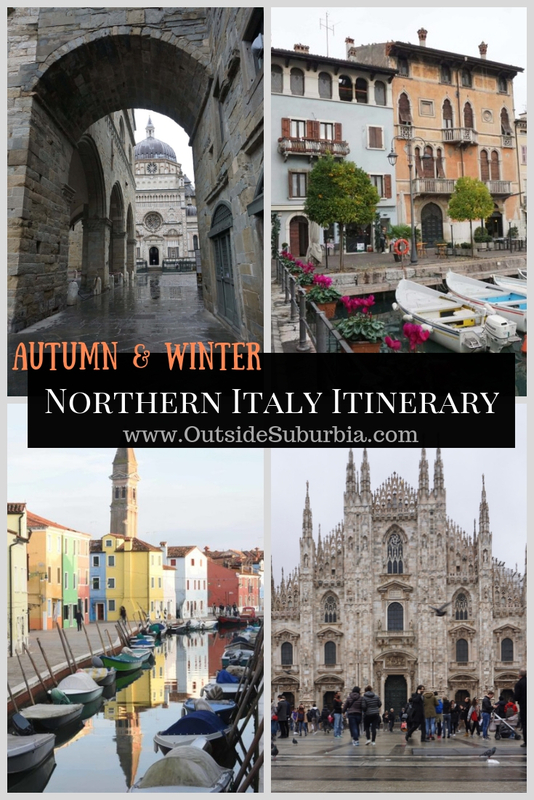 While most Italian itineraries are set on summer getaways – here is why we think Northern Italy in November is a great idea – no crazy summer crowds, no long museum lines, no inflated hotel prices, generous shaving of truffle at every restaurant … and gorgeous fall colors! So we traded thanksgiving turkey for truffles one year and here is our itinerary for a week in Northern Italy, I suppose you could also follow this Northern Italian Itinerary in summer if you didn’t care for the crazy expensive, earthy and pungent truffles much. 12.1 You might like – A photo diary of Beautiful Bergamo, Getting lost in Venice, Top things to do in Florence and other posts from Italy. We landed in Milan airport and took a train from Milan Central to Verona, we were flying out of Milan, and decided to spend a few days here on the way back. We took a train to Venice from Verona. After a couple of days in Venice we rented a car and drove back to Milan. You could do that or fly into Venice and fly our of Milan, seeing Venice from the plane is quite a sight. Verona still feels like a Shakespearean town, strolling around the streets you can almost feel the romance in this “city of Love”. 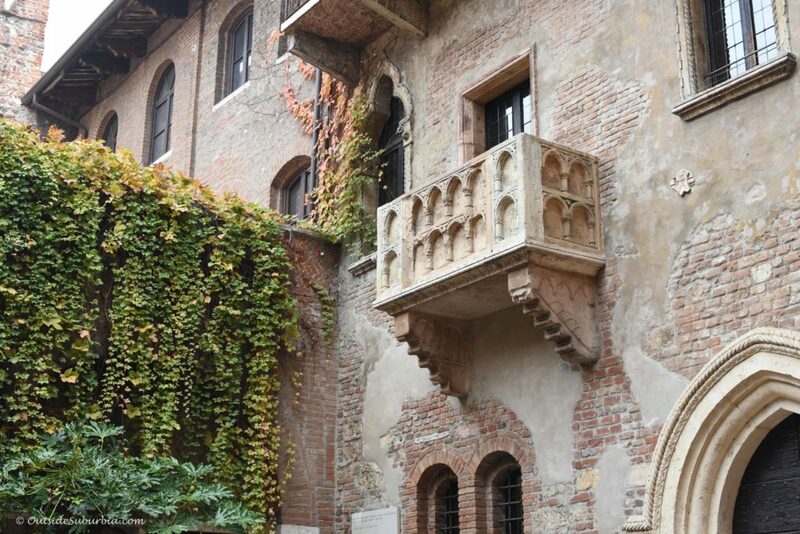 You can recall the main moments of the timeless and tragic love story of Romeo and Juliet in Verona. Christmas markets in Verona opens during late November, and it is pretty romantic. Verona considers itself the hometown of Romeo and Juliet, and there are several places you can relive the lovers’ story. The most famous spot is Juliet’s House. The building dates back to the 13th century, and has the Capulet’s emblem on the external façade. A gate opens onto a covered space where lovers from all around the world leave their messages. The walls and panels are covered with writings, locks, notes and cards. Verona is dressed in lights, sounds and colors of Christmas in November and December for the Christkindlmarkt The Christmas market in Verona is held at Piazza dei Signori, an UNESCO World Heritage Site which has always a meeting point for culture and traditions. The entrance to the city will be illuminated by hundreds of lights, going through all the streets of the historic center, and arriving in the beautiful Piazza Bra, along with Roman Arena and decorated with an the impressive Christmas tree on the square. Make time to linger is the stalls and sample mulled wine, truffle and potato pizza among other delicacies. 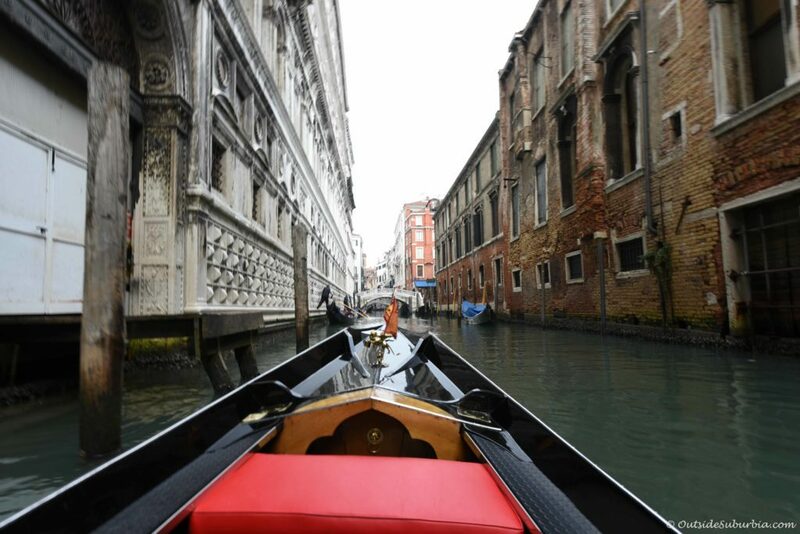 No matter how many times you ride the gondolas in Venice it never gets old. Being in Venice, transports you to another era, it is so atmospheric. This was our third time in Venice, we always love getting lost walking down different alleyways and bridges stopping only for Gelatos always taking in the sights and sounds. Check the tide charts before you plan your days in Venice during the rainy months of November and December as the flooding in Venice is most likely to occur at new and full moons. Plan to take some rain boots, most hotels do have them as well if you end up encountering acqua alta or high water. Burano, is a little Italian island about 45 minutes by boat from Venice. We missed out on visiting this colorful fishing town the last time we were in Venice and wanted to make sure we visited it this time around. It is very similar to Venice but a little more quiet, quaint and so very colorful. It was believed that the local fishermen painted their houses to distinguish it from a distance when returning home in the dark hours especially when it is foggy. 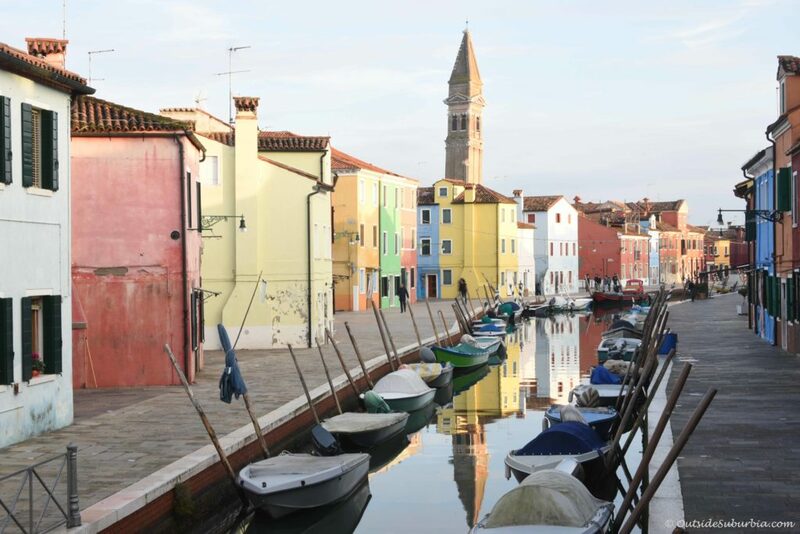 Burano is made up of four islands, separated by narrow canals and connected by small bridges. The colorful houses were lined up in narrow streets alongside the canals where the water seemed to be almost still making for some perfect reflections. We planned to spend a couple of hours there but ended by spending a whole afternoon. It was hard not to miss the leaning bell tower – the Campanile for the Church of San Martino. This tower has been leaning due to the soft ground it stands on. 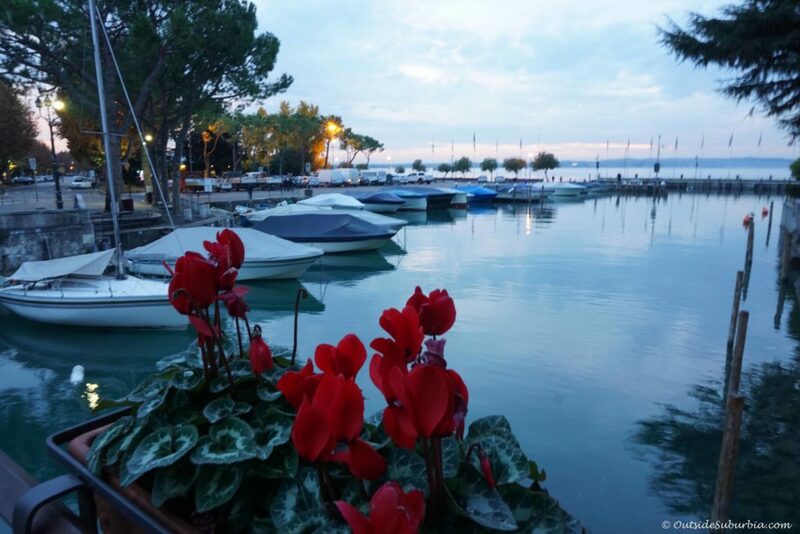 Lake Garda area of Northern Italy was highly recommended by the locals as one of their favorite holiday destinations. We checked with a few before deciding where to spend a couple of days between Venice and Milan. 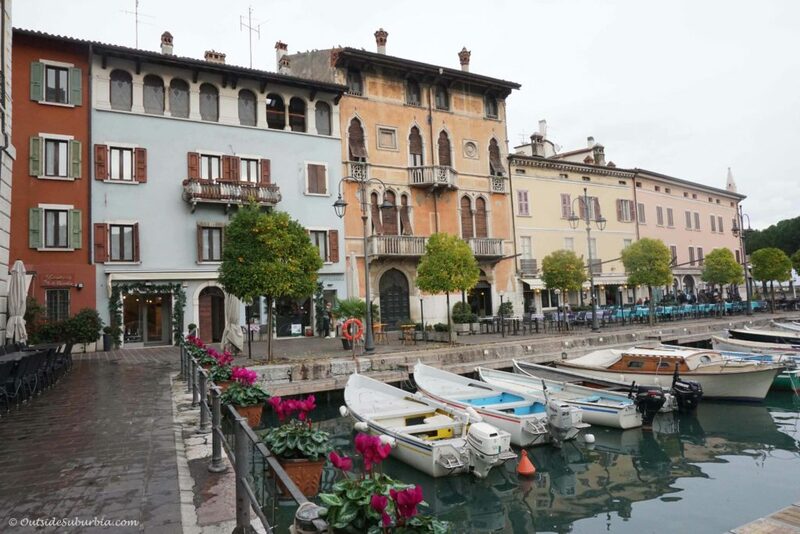 You can go to Lake Como for a meal and admire the beauty of the villas around but if you want an active holiday with the family exploring quaint towns on the lake shore, go paddle boating, swimming, visiting wineries, olives groves – go to Lago di Garda we were told. And that is what we did… and we were surprised at the amount on things there were to do around the lake and the charming towns around lake Garda. There were Christmas markets, promenade lined with shops, sleepy harbors lined with fishing boats and crisp morning air for walks around the lake. The old city of Bergamo called the Città Alta or High City sits high on the hill overlooking the modern city. The medieval streets and buildings and 17th century walls surrounding it are stunning and a perfect place for a peaceful stroll and a meal. While we were in driving from Lake Garda to Milan during our Northern Italy road trip, we stopped in Bergamo one rainy yet beautiful fall afternoon. 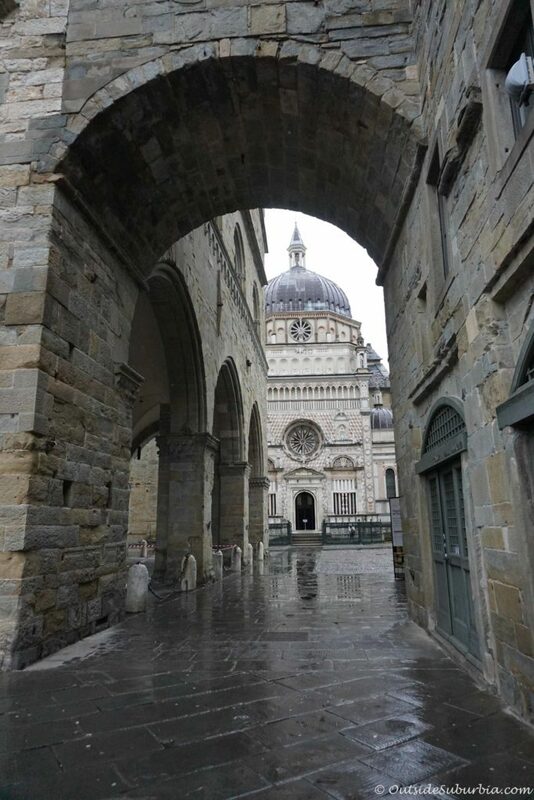 Beautiful Bergamo is just under 50 minutes one-way from Milan on the train or car. The streets of Bergamo, retain the look of a Medieval village, enclosed by its strong walls built by the Venetians in the 16th Century when the the most Serene Republic was at the height of its power – more than three centuries of prosperity and economic development have left their mark in the monuments, institutions and the character of its people. There are well-preserved palaces, churches and public squares, like the Piazza Vecchia (the old public square), Palazzo della Ragione, the Duomo, the Colleoni Chapel and the Baptistery. Stop for lunch here in one of the cozy restaurants and be sure to try the homemade Casoncelli ravioli with bacon, butter and sage and the seasonal risotto made with Piedmont hazelnuts and truffles. Milan has more than its share of attractions – both cultural and cosmopolitan. Mussolini founded the Fascist party here, and the entire fashion world looks to Milan’s catwalks twice a year for the season’s fashions. Artists Michelangelo and Leonardo da Vinci, the composer Verdi, the great tenor Enrico Caruso, and designer Giorgio Armani all lived and worked here. The Piazza del Duomo or Cathedral Square, marks the center of Milan, both in a geographic sense and because of its importance from an artistic, cultural, and social point of view. Exploring the rooftop of Duomo in Milan is not to be missed. The Duomo, or cathedral, is one Milan’s most iconic monuments. A feat of Gothic architecture, its Italian marble facade, intricately carved windows, and lacelike ornamentation took five centuries to complete. It is one of the largest churches in modern Europe and accommodates more than 20,000 people. You can go truffle hunting in Alba in Piedmont. It can be done as a day trip from Milan and can be arranged by the Hotel. We had plans to go on a truffle hunt where you get your boots dirty as you follow a dog and his master through the woods to find the prized truffles. These truffles are sold for upwards of 3000 euros for a kilo, so of course you don’t get to keep the truffle(s) you find. We had to cancel because of the weather. It was raining pretty bad and we ended up driving to Lake Como area instead. Even though most villages are closed for the season, you can still take a ferry boat on the lake and stop at one or two towns to visit. We took the ferry to Cernobbio and walked around the lakefront and enjoyed watching the sunset with some wine and gelato. A nice finish to our Italian holiday. Cernobbio often described as the Beverley Hills of Lake Como has a wonderful lakefront piazza and is home to some fine buildings and hotels like the iconic Villa d’Este. This grand villa with its dreamy terraces, and floating swimming pool is on my wishlist of places to stay someday. Weather in Italy can be rainy, chilly and sometimes windy. Bring jackets, sweater, scarfs, a few layers to keep warm and weather proof boots. Start the day early since it does get dark by 5 p.m. If possible be flexible with plans and don’t be afraid to change them based on the forecast. We saw that there was rain in the forecast for Milan and ended up spending an extra day in Lake Garda and explored the towns around the lake, stopped at a winery and an olive oil mill. Now for the main reason you are here in Northern Italy – truffles. Not the chocolate kind but the rare type of mushroom. Truffles are a culinary delicacy in Italy and are available more in November. There is even a White Truffle Fair held in lower Arno valley in Tuscany at San Miniato. The Tuscan truffle season lasts roughly from September through December. They are as valuable as gold because people haven’t figured out how to cultivate them, and they must be found in the wild. They add a rich umami flavor to food. While France is known for the black truffle, Italy is famous for its pungent white truffles especially from Alba, in the Piedmont district of Italy. Most places we ate were very generous with the truffle. We had them shaved on pastas, pizza and risotto…. and even found a little jar of Truffles in the Christmas market in Verona. While our trip was a total of 10 days and we already had packed too much, if you do have a few more days you can visit Rome, Vatican, Florence and a day trip to Pisa. You will not have to worry about museum lines and most likely have lesser number of selfie sticks in your shots of the Sistine Chapel. The pasta and wine are just as fresh and the restaurants less crowded, the chef might even come linger at you table and you might learn a couple more words in Italian other than Buon Giorno and Grazie. Ciao! Hope this inspires you to plan your trip to Northern Italy in November or any other time! You might like – A photo diary of Beautiful Bergamo, Getting lost in Venice, Top things to do in Florence and other posts from Italy.